The Olympic Factor: How did the Sochi games play into Putin's Ukraine decision-making? Something on his mind other than hockey? 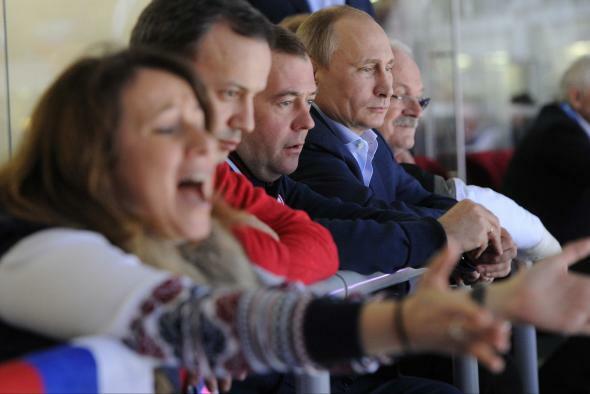 Two authors, writing in the Washington Post this week, advanced some interesting theories on how Russia’s hosting over the Winter Olympics may have influenced Vladimir Putin’s actions on Ukraine. Ultimately, the absence of that invasion is the most striking event of the past month. The Soviet Union would have sent troops into Ukraine at the first sign a pro-Soviet government was in trouble. Indeed, as protests mounted on the Maidan in Kiev, the risk of direct Russian intervention was high; had Putin not sought to keep the world’s goodwill before and during the Sochi Olympics, all of Ukraine might already be back under Russia’s sway with a government willing to use whatever violence is necessary to suppress a pro-European opposition. I’m not sure the timeline quite works here. As of Feb. 21, just two days before the end of the Olympics, Ukraine’s pro-Russian government still seemed salvageable when President Viktor Yanukovych signed a deal with opposition leaders. Olympics or no, it seems pretty unlikely that Russia would have taken as drastic a step as sending Russian troops into Kiev if it still looked like Yanukovych could hang on to power on his own. Putin has stayed in power for so long because he has been able to control the snake-pit of competing informal political networks that surround the halls of power in Russia. At least one of those networks is filled with economic internationalists—the economists, business leaders, and trade negotiators in and around the Kremlin who understand that Russia’s economy is stagnating. They know that corruption is to blame, and that corruption is preventing the Russian economy from undergoing the further privatization and diversification that it needs in order to thrive. Members of that network told some Americans privately in 2013 that they believed some kind of reckoning over corruption in Sochi would happen this spring, perhaps when it became clear that tens of billions of dollars in state loans could not be repaid. At that point Russia would have been roiled by conflict and instability among its elite power holders, as the economic internationalists took on some of Putin’s old KGB and other buddies who benefitted from Sochi. The public might never have known or understood what was happening, but Putin would have lost face where it matters most—inside Kremlin walls, where he is supposed to be the great informal network balancer. Putin’s Crimean adventure neatly shifted the conversation to other topics, and no one is likely to bring it up again anytime soon. This seems a bit unnecessarily complicated. Opposition figures like Boris Nemtsov and Alexei Navalny may have presented Sochi as the embodiment of the rot within the Russian state, but most Russians had a pretty positive view of the games, which—opening ceremony mishaps and scuzzy hotel rooms aside—went pretty smoothly considering the security concerns beforehand. As an added bonus, a number of Putin’s key supporters—some of the names currently on the U.S. sanctions list—got extremely rich off the games. It’s possible that there are more Olympic-related shoes to drop and that the games have exacerbated tensions between factions in the Russian elite, but Putin’s been managing these situations effectively for a long time. The simpler explanation is that the Russian government felt extremely threatened by what it viewed as a coup d’etat backed by its geopolitical rivals right on its border and took steps to salvage whatever victory it could. That said, the combination of the Olympics and the Ukraine crisis has Putin enjoying his highest level of popularity in years at the moment. Of course, the rally-round-the-flag boost may not last as the Crimea situation settles into stasis and the true costs of Sochi become apparent.